Florical automation system components are modular and scalable. Start with a single channel then expand to an interconnected, multi channel, hub/spoke. Begin with Standard Definition, and then add a twin High Definition Channel with independent commercials and as-run-logs. Begin as a spoke station, and then branch off as an independent channel. Florical’s systems are easily reconfigured to match your changing business needs. Florical’s Supervisory Monitor displays multiple channels on a single computer screen including channel status indicators and color coded warnings. A single glance confirms operational status for both program and break material and can be installed anywhere within the station such as offices, break-rooms or Master Control. Add Florical’s Central and Supervisory Monitor can be viewed from any location with access to the web through the station’s secure local network. Florical created two version of the same software. The first (above, shows events which are scaled based on duration (Standard View), the second version shows all events with the same scale. 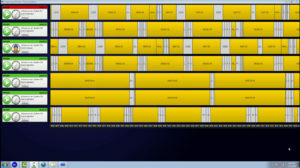 Both versions show status of events on each channel and a down-count for all on-air event; however, the standard view slowly scrolls off the screen for a visual representation of the down-count.